Supernatural 11x20 "Don't Call Me Shurley"
Oh, GAHHG. Obviously the show has been hinting at this reveal of sorts for quite some time. Seasons, really. But, finally, they have confirmed it - Chuck is actually GAHHG. I know some people like that whole idea, but I was never a big fan of it, mostly because it felt like it cheapened his character, who I really liked back in the day. At the same time, it wouldn't really work to make it someone else after all of the rampant speculation over the years, so whatever. Moving on. I'm just going to call him Chuck for the purposes of this here review thingamajig, though. So, yes. I'm not really giving things away by talking about the whole GAHHG reveal, because it happens pretty much at the top of the episode with a destitute Metatron searching dumpsters for specks of food being whisked away to meet with ole Chuck. Now, a lot of the episode is spent with these two just sort of talking. And while normally that could be boring, in this case, it really wasn't. Metatron was the voice of humanity (as well as the fans) in questioning what Chuck has been up to, why he hasn't intervened, etc. He basically calls him out on leaving his creation to succumb to Amara (which apparently wouldn't be the first time), which finally seems to get his attention. 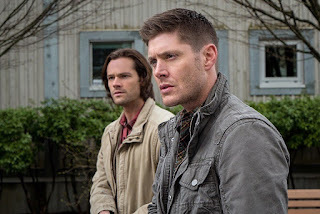 Meanwhile, back in the Earthly realm, the Winchesters follow up on a case that might prove to have Amara connections, and indeed it does. Even though I would say such a case of a murder-suicide out of nowhere seems to happen in regular life as well. But anywayz, they head to the apropos Hope Springs, where Amara is sending her death fog to overtake the town, so they go on a murderous spree. But not Dean. Even though Sam gets to be infected by the fog, Amara is all smitten with her dear Dean, and keeps him safe from said death fog. 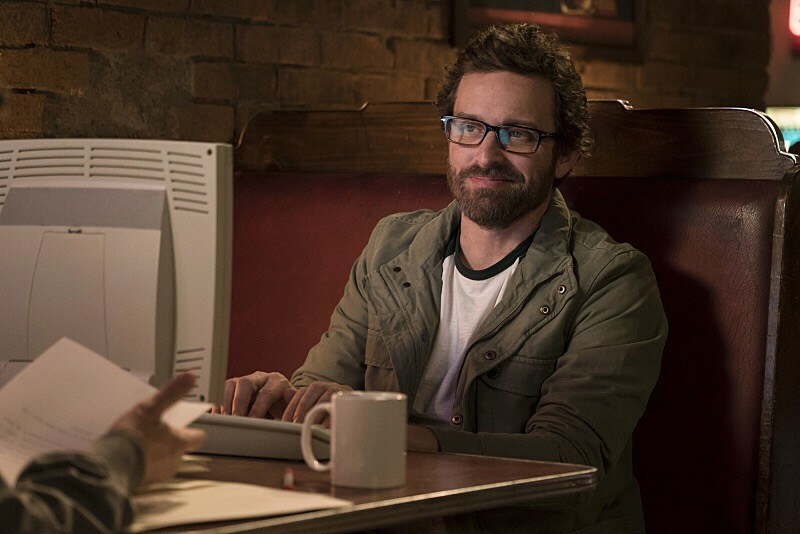 Really, though, it all turns out okay, because Metatron, as I said, finally seemed to get through to Chuck. That it is, in fact, his responsibility to save his creations from his sister rather than let it all disappear, so he does some magic and revives the town, including the erstwhile Sammy. And, in another bit of meta fan service, they bring back the amulet from seasons past. You know, the one Sam gave Dean when they were kids, that turned out to be some kind of GAHHG beacon, but Dean threw it away, etc. etc.? Who am I kidding, if you watch the show, you know what the damn amulet is. Anyhow, Chuck sticks that little baby in Sam's pocket, and the boys follow its light to where he stands in the street. And.... episode. There are a few more episodes left this season, and by the nature of that song Chuck sang there at the end, it seems as though GAHHG may go out in a blaze of glory with his sister at his side. What does that mean for the future? Who knows. They only seem to beget worse things every year, but it might be more interesting to not end things on a cliffhanger for once. Not that they've ever done that, but what the heck. It might've made for a nice series closer. Alas. It goes on. And probably on and on. - Sooo many inside jokes. I do appreciate that sort of meta, when only longtime fans of the show will get it. - I really liked the song at the end. Is that an existing song, or was it written for the show? Either way, Rob Benedict did a great job with it. - One of the only episodes where Metatron wasn't overly annoying. Perhaps because he was kind of the voice of the people in many ways. - It does beg the question, if GAHHG and Amara are brother and sister, do they have parents? And just what the heck does that entail? Metatron: Yeah, Toto. I got a feeling we're not on Earth anymore, either. Chuck: Started a new series of books. Revolution! But I don't think it's going anywhere. Metatron: You are neither grounded nor a person. Chuck: So you're saying I'm likable. Chuck: Nature, divine. Human nature, toxic. The song is a traditional folk song and I found this site that talks about different covers. Thanks! I really enjoyed the use of the song here. Very fitting. And not to mention Rob Benedict killed it!